I recently had the pleasure of sitting down to coffee with Joshua Kissi and Travis Gumbs, the dapper duo behind the upwardly famous style blog Street Etiquette. The blog is gaining rapid popularity not only due to the creators themselves, but also because of their unique emphasis on clothing detail and historical context. Dubbed by Vogue Italia as single-handedly changing the perception of male urban fashion, these mild mannered young men - barely of drinking age - spoke humbly and thoughtfully about the fashion industry, their favorite midnight snacks and of course, girls. "The attention is nice," Gumbs admits after a charming bit of laughter, "it definitely inspires us to keep going." Gumbs, originally from the Caribbean island of St. Kitts, is currently a digital marketing major at Baruch College. Kissi, a Bronx native born to Ghanaian parents, left medical school last year and currently works a retail gig. Make no mistake though, Street Etiquette is where their hearts lie. Gumbs and Kissi were both raised in the Bronx, went to high school together in the Bronx, and though they've collected an impressive amount of frequent flier miles to the elusive country we call "The Fashion Industry", they're not about to abandon their roots anytime soon. "Being from the neighborhood, we know we have a responsibility and we definitely don't take that for granted." reflects Kissi. "We know we have to model a certain type of image for the youth - that's where style and character come together." 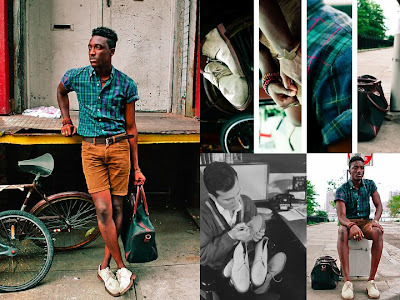 Mihal Freinquel: Street Etiquette was up and running for about a year before you started posting pictures of yourselves and highlighting your outfits - how did it evolve from an NYC lifestyle blog into a personal style blog? Travis Gumbs: Before we started blogging we had been contributing to a lot of online forums and built up a following through those. We realized people were digging what we were doing and that's actually what encouraged us to start the blog in the first place. We started off with the standard kind of [lifestyle] blog that everybody was doing - I think it just took us a little while to get enough confidence to actually put on an outfit and post pictures of ourselves. MF: You guys have garnered a pretty big following. Not only have you been featured in multiple American and international publications, but recently you've started collaborating and consulting with major brands. Why do you think the industry's eyes are on you? Why are people drawn to your opinions? Joshua Kissi: Our opinions are not what people get from the corporate world. A lot of opinions or campaigns are forced on [the public] through advertising, and people can see through that. From us it's genuine, and people want to listen to a genuine voice. Blogs have thrown off traditional marketing - so now big corporations have to reach out to guys like us if they want to have a real connection with the consumer. MF: So what would you say your location is within the fashion industry? TG: We're standing right at the door, mediating between the inside and the outside. I think one of the reasons we've gotten the exposure that we have is because we play every field - we're everywhere and we relate to everybody. Plus our whole upbringing revolved around the street level, so of course it's important to us to stay connected there. We like our position at the door. 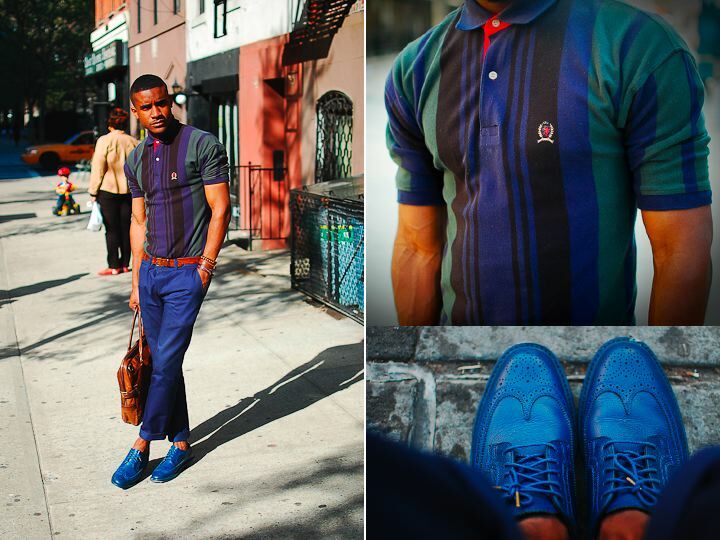 MF: Speaking of the street level, let's talk about the style movement in the Bronx. Three of the blogs that I follow are guys who come out of that borough - you two, The Post Cool and Kadeem Johnson's blog, but other than that it seems pretty quiet. JK: Anybody involved in any kind of style movement in the Bronx is somehow connected. There's no real movement - the area that we're in really hasn't changed at all since the 90's. TG: We all kind of came together because if you're from the Bronx and you're doing something like we're doing, you stand out way more than you would in, say, Brooklyn...you get lost in the sauce over there. MF: As many dudes aren't these days, you're both not wearing socks. How do you keep your shoes and feet from getting smelly? JK: Or loafer socks, we wear those too. But my feet don't smell bad, they smell like roses. MF: Last thing you listened to on your iPod? JK: Jesse Boykins, "Before the Night is Through". JK: Ham and cheese Hotpockets. TG: Wow, that's nasty. I like Eggo waffles...with syrup. MF: I agree, totally nasty. 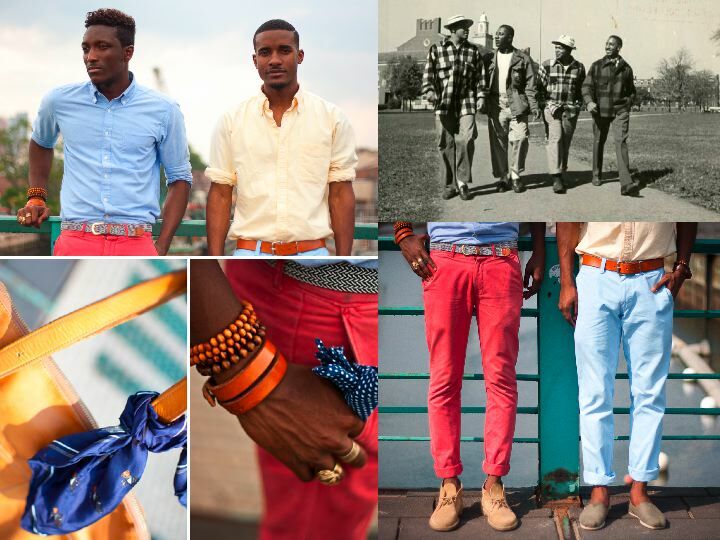 Favorite outfit color combinations? MF: How many pairs of shoes do you own? JK: No idea, I stopped counting. I just keep buying! That's one benefit of living at home, I have a whole room that's just dedicated to my stuff. JK: Yeah I basically have a walk-in closet-room. My parents got tired of all my stuff so they just gave me a room. TG: I like to play basketball. JK: I play several musical instruments - drums, bass, a little piano - most people don't know that about me. JK & TG: Jake Davis, Robert I Brown - he's a 16 year old blogger out of New Orleans, pretty much everybody in our circle. In terms of girls: Karla's Closet, His Hers Chicago, Jazzi McGilbert - Jazzi was just featured with us in Essence's 10 Fashion Bloggers You Should Know. There are so many bloggers out there it's amazing. 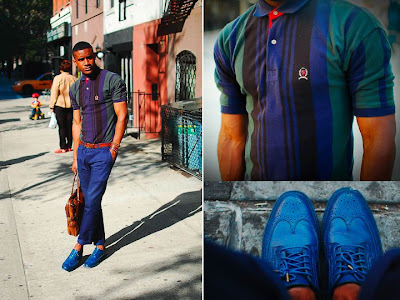 Luckily for the charismatic fellas of Street Etiquette, the rising popularity of bloggers has helped them in their journey. They were recently guests at several New York Fashion Week shows, crediting G-Star with the most impressive presentation. (Want to know what they wore to the NYFW shows each day? Well it just so happens that GQ chronicled their outfits). But it's not just about outfits with these guys - as exemplified through their blog, style is most significant when examined within a greater social/historical context. MF: You guys recently posted a video project entitled "The Black Ivy" and it was received with mixed reviews. It seems as though people were either overwhelmingly supportive and appreciative, or hyper-critical of its racial representation. TG: I think a lot of people lost the message under all of the pictures and video. [People who reacted negatively] didn't get that The Black Ivy is about more than just looking good. The message is about being progressive, about unity and upward mobility, and also paying homage to the past. JK: The Black Ivy project is an art-form and art is always judged both negatively and positively. I think as long as we're getting people to think, and we're reaching out to them emotionally, that's always a good thing. Don't forget the names Joshua Kissi (aka Josh or JKissi) and Travis Gumbs (aka Trav). These creative and totally dashing young men are just at the beginning of their adventure. I wish them much success and many, many sharp outfits to come. All photos courtesy of SE.